Read our full Destiny review. Upcoming genre blender Destiny, the latest project from Halo creator Bungie, was first demoed at last year’s E3. Sony brought the game on stage at this year’s show with something better than just gameplay footage. 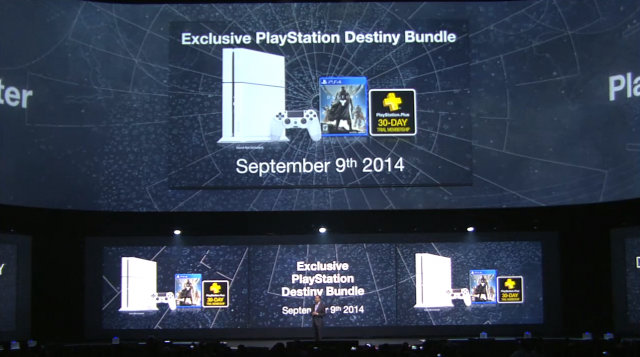 Gamers will be able to pick up Destiny along with a Glacier White, 500GB PlayStation 4 upon its release. The console bundle will give gamers a chance to pick up the popular Sony console along with a game the company hopes will prove to be a hit the size of Halo. Along with the uniquely colored console, matching controller, and the game, the package deal will also include a 30-day trial of PlayStation Plus. Gamers awaiting entrance into the open sci-fi world of Destiny won’t have to wait much longer. The game heads into beta for PS4 users on July 17. For those who find that to be too far into the future, PS4 owners can try out the alpha starting Thursday June 12 through June 15, 2014. Destiny will receive a multiple platform release, debuting on both the PS3 and PS4 as well as Microsoft consoles Xbox 360 and Xbox One on September 9, 2014.